One error, another point dropped for Pools and a massive opportunity missed. This was a game decided by an inexplicable error from a player who seems totally incapable of cutting these kind of mistakes out of his play. The question on everyone’s lips - what was Louis Laing thinking? A speculative long-ball from former Pools full-back Darren Holden was hardly dangerous. That kind of ball is normally meat and drink for central defenders. But with little to no pressure and a point seemingly in the bag, Laing somehow contrived to not only get his header all wrong, but weight it perfectly for match-winner Dayle Southwell, who strode through to net in the fourth minute of added time for a smash and grab raid of the highest order. 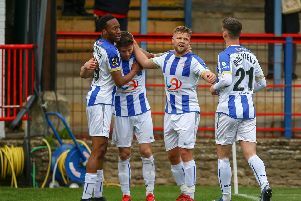 With Solihull Moors’ match against Tranmere Rovers falling foul of the weather, Pools had the chance to increase the gap to 10 to the National League, but let the opportunity go begging. Instead, due to Laing’s shocker, they remain seven points clear. It should be enough, but they’ll be kicking themselves that they’re not a step closer to safety after a largely frustrating afternoon. It seems harsh to put this failure on the shoulders, or head, of one player, but I’m sure Laing, a well-spoken, mild mannered gem of a lad about the place, himself will hold his hands up on this one. He is a player who has looked like a real find lately. Confidence has flooded back to his game, and he’s looked like the player who Manchester United decided to take a look at when he was a kid. But there’s a reason Laing, once dubbed the next John Terry, is playing non-league football, and his mistake in the 94th minute proves that. He’s built some bridges with the Pools faithful of late with his towering, powerful performances at the heart of the backline. He needs to show some character now to make sure he doesn’t take one step forward to take two back. On the selection front Matthew Bates stuck with 10 of the 11 who were triumphant at Maidstone - only Rhys Oates dropped out of the side, with Devante Rodney coming in. While Pools’ passing was slick in the opening 45, they lacked a killer instinct. Only a Louis Laing header from a Blair Adams corner and a long-range Josh Hawkes effort troubled Guiseley keeper Joseph Green in the opening 45. Needing a win, the visitors showed a bit more ambition towards the end of the opening 45, having largely frustrated their hosts. That carried on into the second-half, and a Lewis Hawkins error opened up the best chance of the game for Southwell. Hawkins attempt to take the ball down allowed Callum McFadzean to advance towards the Pools area, and as Scott Loach advanced he slipped the ball to Southwell, who, with the goal gaping, hammered wide. It was a real let off for Pools, who never really got going after the break. Substitute Ryan Donaldson, back after six months out with an ankle problem which required two operations, had the chance to win it in the closing stages but he could not keep his header at the back post down. With a point seemingly secured, an innocuous long ball forward in the 94th minute was stopped by Laing, attempting to head it away, opening up a free run at goal for Southwell, who, having missed a gilt-edged chance earlier, made no mistake.